It is unusually quiet at the Beerhorst house today. The two littlest girls are over at "the Shaws house" down the street. Dove is at a back yard campout sleep over that she has been living for ever since her invitation. Shepherd, it's hard to say, he's been gone prettymuch all day some where,at one of his many friends in the neighborhood I suppose. Rose is on her way to the mountains of Woyoming for a week long hiking expedition with a group of youn people from a church in Big Rapids MI. Pearl must be up in her room reading as is Brenda. Brenda and I are in the midst of a cleansing fast today maybe for three days it we can hold on that long. This will be the first time I have ever fasted for health reasons. We are just drinking lots of water and red tea in the hopes of ridding our bodies of the bad stuff that tends to hang around inside of us. Aparently a cleansing fast no and then enable your body to be able to heal itself. Also the body is better able to absorb the nutrients it needs when it is clean. What do you think of the cool picture from my 70s past? My big brother Ray was an amature photographer who even had created a dark room in the basement inorder to develope his own film. 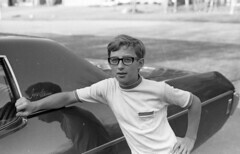 He was also a gear head hence the shiny chevy I am leaning on. It's kind of funny to think that I have lead my family into a life beyond the tearony of the automobile. We have been without a car for nearly two years now.